Talia Bugel has firsthand knowledge of what it's like to grow up speaking one language at home while using another at school. For Bugel, a native of the South American country of Uruguay, those languages were Spanish and French, respectively. 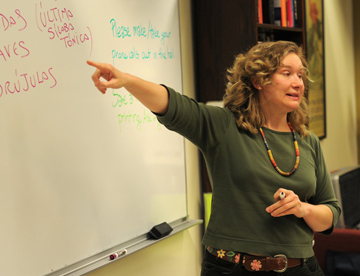 Now, as an associate professor of Spanish at Indiana University-Purdue University Fort Wayne, Bugel shares the benefits of multilingualism and multiculturalism with her university students. She also searches for the best ways to serve public school students who speak Spanish at home, preserving their bilingualism. How did you become interested in language-related studies? Foreign language learning in Uruguay starts in grade seven for everyone, but parents generally send their children to private language classes earlier than that, at around 10 years old -- language classes are very affordable in Uruguay. My parents were very conscious of the benefits of multilingualism and multiculturalism, so I started learning French when I was 3 years old. I went to French school in Uruguay and completed all my elementary, middle and high school work in French. The humanities orientation in high school also requires two years of Italian, which I took. When I graduated from high school, I decided to pursue an undergraduate degree in translation in Uruguay, because I wanted to explore the subject a little more. Through those studies I began learning about linguistics. I realized I loved learning about all the different ways in which languages can be researched and about how the brain processes languages. Eventually, I earned a master's degree in applied linguistics in Brazil and a PhD in Spanish at the University of Illinois. I speak English, Spanish, French and Portuguese. I also took one year of Arabic and I would like to retake that and go forward. What is the most important consideration when teaching Spanish to your students? It's very important to provide students with multiple opportunities to interact in the target language. Language classes have to be taught in the target language -- for example, I teach my Spanish classes in Spanish. I incorporate lots of group work and pair work in and outside the classroom. My students also complete service-learning projects that involve interactions with Spanish-speaking community members. For example, students in my Spanish translation class have worked in an elementary school in which about 35 percent of the students come from homes where only Spanish is spoken, but there is only one bilingual staff member at the school. The service learning involves translating materials so that bilingual editions are sent to the parents so they can help their children with homework and with school activities. My students also interpret orally at parent-teacher conferences and do interpretation at school events. In what other ways are you helping Spanish-speaking community members? Right now, I'm beginning a study looking at Spanish as a heritage language in the U.S. With three colleagues at other universities, I'm looking at how households maintain Spanish as a family language, and at how heritage speakers acquire Spanish at home and in the classroom. I'm also trying to determine the best pedagogical options for students in the Midwest who speak Spanish at home to maintain their bilingualism and biculturalism. We certainly don't want people to lose the benefits that multilingualism provides, but we want to learn how to best serve them in schools and for that we need in-depth information. Language attitudes are also a big part of your scholarship. What are those? Language attitudes are the ways in which we react when we hear different languages, dialects of a language, or accents. For example, when you hear someone speaking with a British accent, most likely you'll form a mental image of the person based simply on the way they speak. Interestingly, researchers have shown that these attitudes are not linked to any internal properties of language. They're linked to extra-linguistic information tied to social, political, educational and other factors. I study how these attitudes can either be reinforced or deconstructed in the classroom. Ultimately, if students have prejudices about a language, those will stand in the way of them learning that language. Inversely, there are idealizations about some languages -- say, for example, if a student sees French as a very romantic language, that might support them learning that language. As a language and linguistics professional, I want to help society and my students deconstruct the internal prejudices they may have against some languages and their speakers. If I can increase people’s motivation to learn a language and its cultures, then I've achieved one of my goals.